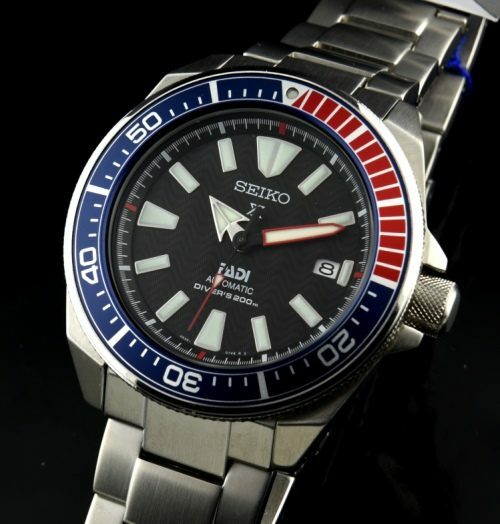 We are an official SEIKO dealer. This Special Edition for “PADI” watch is brand new in the box and I own this exact model myself. I chose this watch due to the very easy to read and extra-bright glowing dial at night and under water. The large 44mm. case has interesting angles, screw-down crown, sapphire crystal and uni-directional “Pepsi” bezel. I Love the wavy dial and fine detailing throughout. The bracelet has a diver’s flip-lock safety clasp. Th SEIKO automatic movement is superb. You will love this watch!